I thought that it would be fun to try to round up as many online resources for folks who are interested in soda firing and put it together into one handy post. Since there isn’t that much publish (relatively speaking), I think it has the possibility of being relatively comprehensive. I hope you enjoy reading the results of my research as much as I did! You might remember this site that is all about Salt and Soda firing that I wrote about a while back. It’s a social networking site for all people interested in these firing processes. There are some fantastic potters and sculptors that are a part of this site as well as students who are just beginning to dabbling in soda. I highly encourage you to dive in- sign up and make a page. The more the merrier (don’t be shy if you’re just beginning in soda!) There are recipes for slips and glazes as well as a forum for putting questions out there. Are you thinking about converting an old electric kiln into a soda kiln? There’s a discussion going on here for you. And this site is always evolving- it’ll be whatever the members make it. Salt & Soda tags on the ClayArt archives on Potters.org. It’s worth digging into. It’s quite possible that someone else had the same exact question as you 8 months ago. Julie Rozman, a fellow Lillstreeter, also writes a blog, Design Realized. She shares a lot of her glaze testing and firing info on her site. You should be sure to check it out! Scott Cooper makes beautiful wood & soda fired pots. He also writes about his work and process in his journal, This Week @ St. Earth. You should also be sure to check out his “process” page where he has tons of information that is interesting and helpful. Keith Kreeger makes salt/soda fired pots at his studio/gallery on Cape Code (although he has been venturing into earthenware lately). You can learn more about his soda work on his blog, Kreeger Pottery Blog. I just discovered Joy Tanner’s Blog. I’ve gotten to know Joy’s work through the Salt/Soda group and I’ve excited that there is another soda firer writing a blog! Julia Galloway’s Alchemy page. Julia generously shares with her information on cone 6 soda firing, including slip and glaze recipes. Scott Cooper (as mentioned above) has a great process page with tons of information on kiln building, glaze recipes and even clay recipes. Not to mention some beautiful pots! Bill Buckner’s site, sodaglaze.com is full of soda info. There is a great article on soda that you should check out. He also has a bunch of recipes and firing info. Robbie Lobell makes beautiful, elegant soda fired ovenware and tableware. 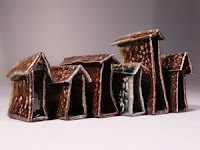 He has a page on his site about his kiln and soda firing process. He lives in Coupeville, WA mentions on his site that he will rent out 1/4, 1/2 or the whole kiln to experienced firers. 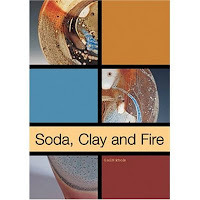 Soda, Clay and Fire by Gail Nichols is a must have for anyone interested in firing with soda. This book is the culmination of Gail’s PhD work in soda firing in Material Science at Monash University in Gippland, Victoria, Austrailia. The research is incredible and it’s an easy read. Two things that don’t always go together so easily. I think if you picked up this book knowing clay, but not knowing soda, you might decide that you need to start soda firing by the end. But I’m a bit biased on these things. You can also learn a bit more about this book here. Ruthanne Tudball’s book, Soda Glazing is the original text on soda firing. There has been so little actually published on soda (especially in comparison to other firing techniques) because of the youthfulness of the process. This is a book that I kept close to me for many years. There are overviews of different potters and their soda approaches as well as a great index of glaze, slip and clay recipes. Again, this is a book that you need to have on your bookshelf if you’re making soda fired work. Salt and Soda-glazing article on Ceramics Today. Soda Firing by Robyn Gough on Avicam. A New Soda Kiln: a kiln conversion project by Robyn Gough, Maryke Henderson, Robyn Whitworth on Australian Ceramics. Why Soda Glaze? by Maryke Henderson on Avicam. Soda with Sparkle: A profile of soda glaze specialist Ruthanne Tudball by Judy Adams in Ceramics Monthly. Painting with Fire by Gail Nichols on Ceramic Arts Daily. In the Soda Zone by Mark Bollwinkel on Ceramic Arts Daily. I really have enjoyed this. Please send me links to things that you think might be missing from here and I’ll keep updating this post. This was a big project and I had to put some sort of limits on it. I decided not to include links to soda firing potters & sculptors in this post. I know that there a ton out there with great websites, but I thought I’d limit it to sites that had technical information on it. Another post will be soda firing ceramicists. That will be fun ; ) If you want to give me a hand with that, just leave a comment with suggestions for me to include. Just remember: folks who fire with*soda* or *soda/salt,* but not just salt. I regularly get questions emailed to me about clay, kilns, the business of clay, etc… I have decided to start a series “Ask a Potter” where I answer some of these questions on PotteryBlog.com that I think will be interesting and helpful to other readers. Please feel free to share your 2 cents and join in on the dialog! Who takes your photos? What kind of camera do you use? My “professional” images are taken by Guy Nicol in Chicago. His studio is also at Lillstreet Studios. If you’re not in the Chicago area, don’t let that stop you, you can ship your work to him. I have been using Guy for my photos for the last 7 years, and his work is amazing. He specializes in studio arts such as ceramics, jewelry, fibers, etc… I’ve used the images he taken to apply to shows as well as promotional materials (postcards, business cards, etc…). Some of Guy’s images of my work published in exhibition catalogs, 500 Cups (2 images), 500 Pitchers (2 images) and Ceramics Monthly. I do take lots of photos myself that are posted on this blog. I got a new digital camera early last fall, the Canon PowerShot A570 and I’ve been really happy with it. I would say the photos that I take myself fall into 3 categories – personal, studio shots/ works in progress, and images for online selling. I’ve been dabbling in online selling for a while trying to figure out what outlet I think is best. I’m finally ready to jump into the Etsy pool (more on that to come!) and easy, high quality photos are a necessity.